Adriana, with one 8 year old son gives credit to the 8 Weeks Busy Mum Program for helping her lose 10 kg and get back to size 12 from size 18 and still getting results 5 months after upon starting the 8 Weeks Program. 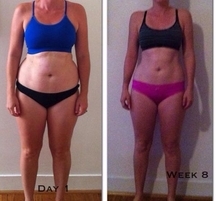 Melissa felt amazing joining the 8 Weeks Busy Mum Program. Not only she managed to loose weight but so as create a new lifestyle for her which her whole family is following now too. What I like about the Busy Mum Program was the exercises you can do at home. You don’t have to join gym and you don’t have to buy special ingredients for the meals and the support from other mums on the same journey using the facebook page was amazing as well as the support from the trainer. Megan just finished her 8 Weeks Busy Mum Program and she was happy that now, whe was able to sleep better and has gain more energy after eliminating all the additives in her meals so as made it all family friendly. The great thing about Busy Mum is that it does slide into your lifestyle, you can squeeze it in no matter how busy you are. You have to cook meals, you squeeze it in. And the workout, you can do anytime and you can do it at home so you don’t have to go anywhere to squeeze an hour at the gym or forget how to do that. When it comes to being busy, surely Meliza will be on top of our list. She has 4 kids, works full-time but still able to nail the results she wanted. She shredded 48 cm all over her body and she’s definitely healthier, happier and very much contented with Busy Mum 8 Weeks Program. The best part of it is the fact that you got your weekly page; you got your weekly workout and your meal plans and its just so easy. Our amazing sporty mum Jacqueline, defies her age by rocking a body of a post baby early 20’s when in real, she’s now at her 40’s (age is just a number aye!). Now she’s enjoying her life having all the energy she needs for her demanding days. Its a hard work but you will get result. I love the education, Kelly is posting a couple of videos of educational stuff regarding sugar, fat and regarding all other things and getting new information from her. And after a couple of weeks, you really really change your mind. and its gonna be an absolutely normal that you see the food in a different way and your cooking in a different way… I have all the energy to get the days over and to enjoy the days and to enjoy me and to enjoy my life and the things which I receive yet and you also get to plan your life and how to change your mind and to get the next plan to your life.